1. 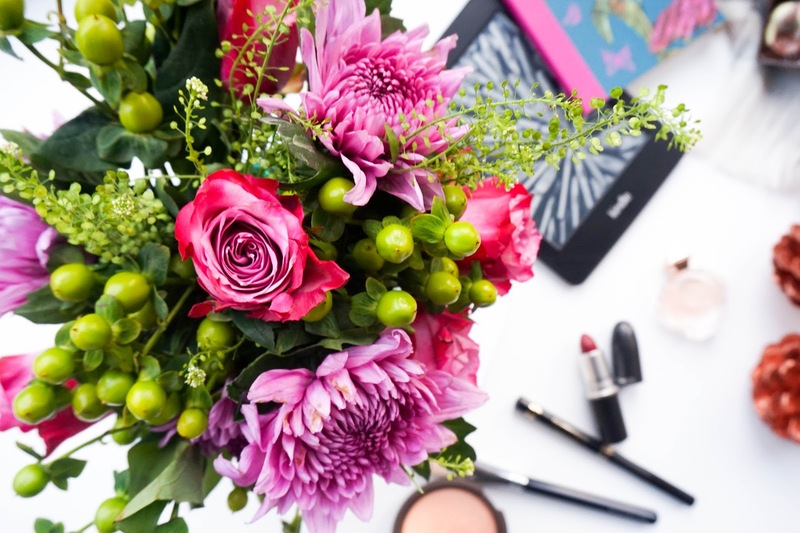 Fresh flowers - there's just something special about receiving a beautiful bouquet of flowers or even treating yourself to one (no shame in that... I've found myself buying flowers on many occasions despite the fact that I'm in a relationship). 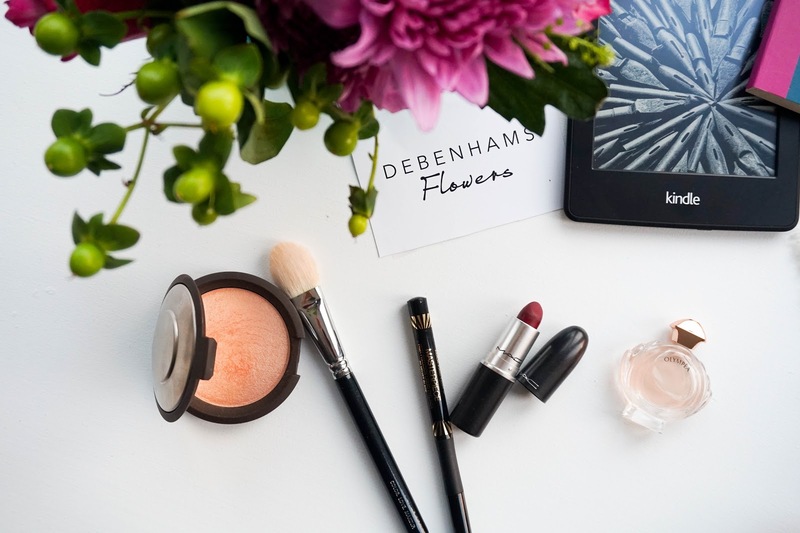 This time around though I was lucky enough to be sent this stunning Boho Bouquet* of flowers from the lovely team at Debenhams Flowers and let me tell you that it instantly put a smile on my face. The pink/purple toned bouquet sits beautifully on my windowsill and just adds a touch of colour to the rest of my minimal apartment (when you have a 3 year old trust me your apartment needs to be kept minimal). I can even detect the gorgeous scent of roses every time I walk past to remind me that it's there. 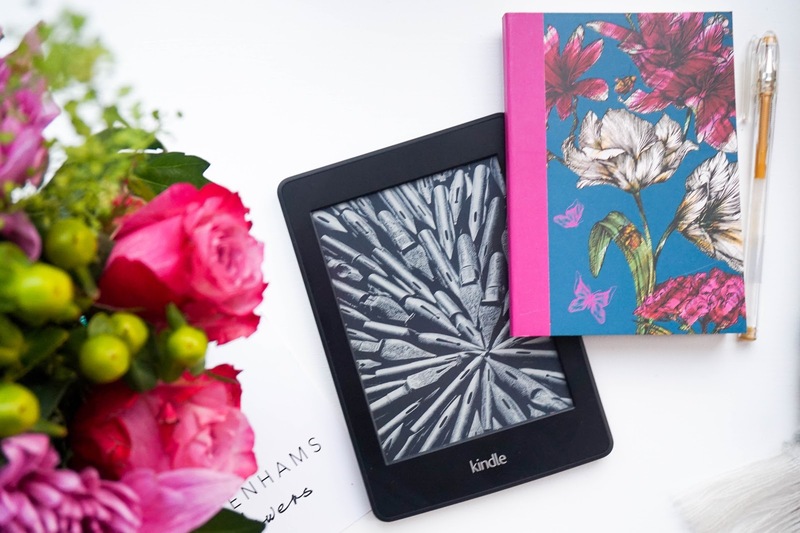 Debenhams have kindly offered me a 25% discount code DFBLOG25, which you can all use on any of the bouquets available so definitely keep that in mind if you decide to treat yourself or someone else. 2. Chocolate - ok so I'm not just talking about the typical judgements that have been set in place about women needing chocolate pretty much to survive. I'm talking about the fact that it's been scientifically proven that chocolate releases happy endorphins and a little bit everyday is actually healthy/good for you (dark chocolate to be precise). Leaving science to one side I'll be the first to admit that I just can't go a few days without having a cheeky treat, usually in the form of chocolate and I feel like it's perfectly fine as long as it's all done in moderation. 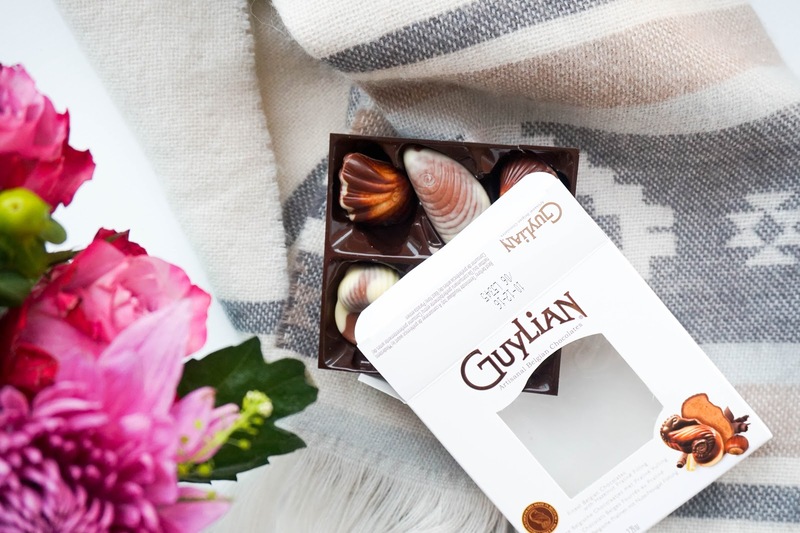 Keeping myself on a strict healthy diet would definitely turn me into the biggest grump, so when this box of Guylian Chocolates* were sent along with the Debenhams Flowers I knew I had to include them as part of my feel good tips. 3. Makeup - as superficial as it sounds makeup does make me feel better on a gloomy day. I'm not talking about completely wearing a mask, but more like wearing certain products to enhance the natural beauty within you. I truly believe that when you make an effort with your appearance on the outside you will instantly feel better on the inside. 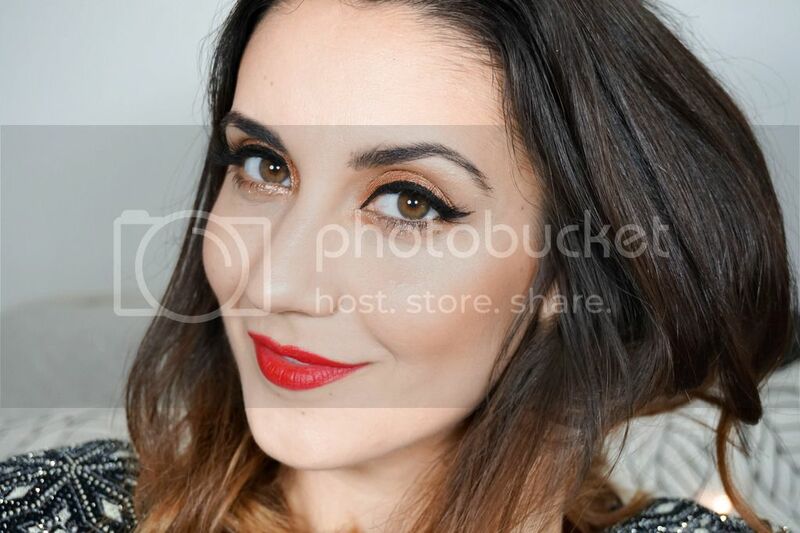 For me it takes a little bit of eyeliner maybe a bold, bright lip & a spritz of my favourite fragrance to brighten my day. I think the whole prejudice around women and makeup these days has got out of hand and people really need to calm down at the best of times. We should be able to express ourselves through makeup & use it as a tool to lift our spirits if we want to, without being judged or frowned upon. 4. Reading - I don't get the time to do this enough but whenever I get stuck into a good book I always remind myself that I need to do this more often. Reading completely relaxes me & just puts my brain in pause mode. I love picking up my Kindle once I tuck up in bed, because it's my fail safe method of falling asleep within a reasonable hour when I do. Unfortunately most evenings is the only time I get to myself to blog so I take advantage of that little bit of free time to keep up with my hobby. This usually results in my head going 90 miles an hour with ideas or focusing on my blogging to do list so I never fall asleep earlier than 1am, which let me tell you is a toughie when you've got a toddler up & ready for the day ahead at 7am in the morning. January has definitely been focused on reading more for relaxing purposes to keep myself in better spirits because let's face it a good nights sleep equals a happier self overall. 5. 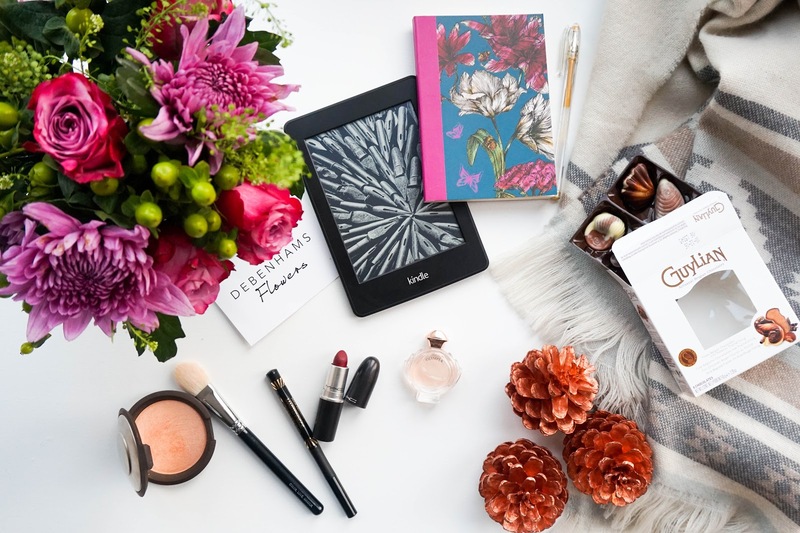 Blog Organising - last point does bring me to keeping myself focused & organised when it comes to blogging. After taking a two week break over Christmas I always come back in a bit of a panic mode because I've got nothing planned in advance plus a ton of comments/blogs to catch up with. This January however I decided to take it one step at a time by focusing on blog ideas for the month and then gradually ticking things off the to do list. It means that I'm nowhere near prepared for the month ahead and I'm certainly writing posts the night before, but I'm not stressed about it all either. I 'm confident that I'll catch up with it all by the end of the month and get myself organised eventually. Hopefully once that is done I can start focusing on YouTube again... that's certainly had no attention from me right now, but at the moment I really just haven't found the time, because the blog will always come first for me.